Eva Hesse (1936–1970) is seen as one of the central figures of art of the 20th century. Though her most productive period of creativity lasted no more than a decade, she left behind many sculptures, drawings and paintings now being sold for millions. With an artistic style that is difficult to classify, she made breakthroughs within an art world dominated by men. She would become an icon of feminism. Her life, full of transitions, tragic, and much too short, is for the most part unknown. Michael Jürgs, the biographer of Romy Schneider, has had exclusive access to numerous revealing sources concerning the life of Eva Hesse, and has interviewed many people who were close to her. His biographical work of a woman who was once characterised by a critic as the female “James Dean of art” is a stirring and moving reading experience for all those with a predilection for great biographies of women, in particular of women artists. 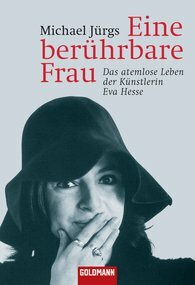 Eva Hesse was born in Hamburg as the second daughter of Jewish-German parents. After the pogrom in 1938, her parents sent her and her 5-year-old sister, Helen, in a children’s transport to Holland, where they were temporarily housed in a Catholic home for children. The family eventually fled to England and then on to America. All of their relatives would die in the Holocaust. Eva Hesse became an American citizen in 1945. That same year her parents divorced. One year later her mother, having suffered from manic depression for many years, committed suicide. Her father soon remarried. Eva and her step-mother had a strong life-long relationship characterised by resentment and antipathy. Eva began her artistic education at the High School of Industrial Design. Later she studied at the Pratt Institute of Design and was a volunteer at Seventeen magazine. She began undergoing psychoanalysis in 1954. In September of that year she began her studies at the Yale School of Art and Architecture in Norfolk, receiving her degree in 1959. In 1961 she married the abstract expressionist sculptor Tom Doyle, eight years her senior. In April 1964, at the invitation of the German textile entrepreneur Arnhard Scheidt they travelled to Kettwig an der Ruhr. By that time their marriage was beginning to unravel. They remained in Germany from June 1964 to August 1965. Back in New York, the first art exhibition of Eva Hesse’s work took place. Her marriage with Doyle, which she described in her journal with feelings of hate, anger, worry, and depression, came to an end in the winter of 1966 to 1967. During those years Hesse was at the peak of her artistic creativity. In 1969 she collapsed while working and was diagnosed with a brain tumour. In the following months she worked furiously, many of her artistic projects being completed with the help of her assistant. On May 22, 1970, Eva Hesse fell into a coma and died seven days later, at the age of 34. Today, Eva Hesse’s work is represented in all the prominent museums worldwide: the Modern Art Museum and the Guggenheim and Whitney Museum in New York, the Modern Art Museum in San Francisco, museums in Düsseldorf, Wiesbaden, and Bern, and the Modern Tate in London. Many artist look to her as an ideal. She went beyond borders, exploring new artistic realms with her work using material such as latex, artificial resin, cloth, and paper maché. Going her own way in her private life and asserting herself in the male-dominated art world, she remains today an icon of feminism. Thus far very little has been written on the life of this German-Jewish-American artist. Michael Jürgs, an experienced biographer and bestselling author, is the first to tell the life story of this unique and fascinating woman. Jürgs presents Eva Hesse’s life from Hamburg to New York as closely as possible in the context of her artistic development. He illustrates how much her early traumatic experiences – the persecutions in Germany, fleeing her homeland, the early, tragic death of her mother – influenced her art and at the same time allowed her to tap into phenomenal energy. Jürgs is not interested in presenting a transfigured artistic life along the lines of the myth that great art is created through suffering. Instead, he reveals the other side of Hesse: a vital woman hungry for life, who overcomes the tragedies in her life with an ability for (self) irony – in her private as well as artistic life. As a basis for his work, Jürgs had access to sources from Hesse’s estate, including personal documents, journals, and calendar notices. He also interviewed many people who were close to her, such as Tom Doyle, her sister Helen, the children of Scheidt, her psychiatrist, and various friends and acquaintances.